Read the full report to see how we came up with these numbers. Radar satellite image of 21-mile-long slick apparently emanating from Site 23051 on July 16, 2011. 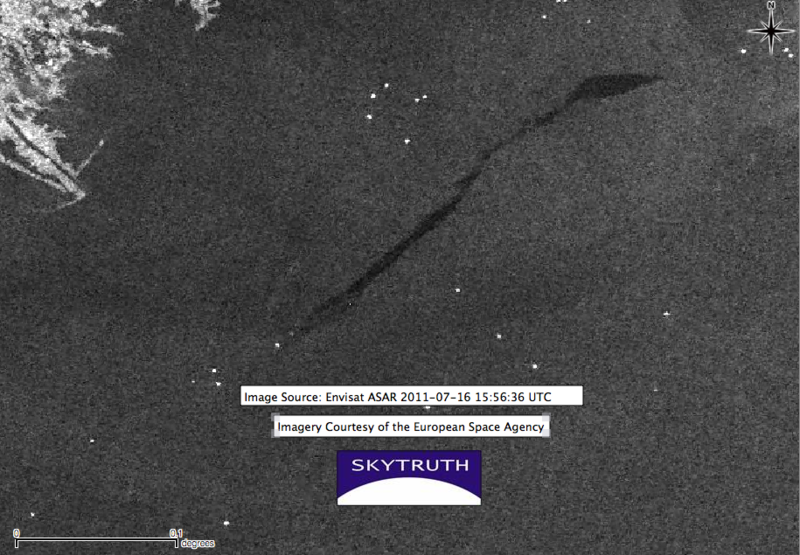 Envisat ASAR image courtesy European Space Agency. We created this report using 950 pollution reports filed with the National Response Center (which we presume were filed by the polluter, Taylor Energy) covering 714 out of 2,662 days (just 27%) from the first report of oil at the site on September 17, 2004 through the end of 2011. 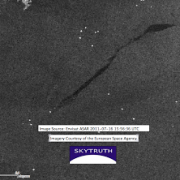 We filled in the substantial gaps in this official public reporting record with observations on satellite images, and then computed an Estimated Average Daily Slick Extent. From that we derived an Estimated Average Daily Flow Rate for each calendar year since the spill began. Multiply the daily flow rate by the number of days the site has been leaking, and you have an estimate of the cumulative volume of the spill. For average thickness, we used our tried and true standard of 1 micron (1 millionth of a meter); we also computed everything using 0.5 microns to reflect the possibility that this slick is thinner than most. For degradation half life, we assumed that one half of a given amount of a thin slick of oil on the surface of the ocean will degrade in 3-7 days. We believe this range is a very conservative assumption, because the longer the assumed lifetime of oil on the surface of the water, the lower the implied daily flow rate will be. SkyTruth, the Gulf Monitoring Consortium and others have been actively monitoring this site for 21 months since May of 2010 (during what turned out to be the early days of the massive BP/Deepwater Horizon spill), when we noticed on our satellite images another much smaller slick about 11 miles off the tip of the Mississippi River Delta. As far as we know, our report is the first comprehensive attempt to estimate the total amount of oil spilled at this site. However, the Coast Guard was recently quoted in an AP news article as saying “a total of 12,720 gallons of oil have been reported from daily observations since the spill started in 2004”. We called the Coast Guard last week and asked them where that number came from, and they told us “Approximately 12,720 gallons have been reported from daily observations (over flights) as of 2/2/12.” Today we followed up and the Coast Guard told us that this number is the total of all the reports filed with them by Taylor Energy who is conducting the regular overflights, but they could not say how many reports this represents. The environmental and economic damage from this chronic spill may be relatively minor, although if you ask a biologist and tell her it’s a 1.2 million gallon spill, you might get a different answer than if you tell her it’s only a 12,000 gallon spill. But imagine that the same event that wiped out Taylor’s platform just 11 miles off the coast, had instead happened at a deepwater platform 100 miles offshore.